It is hard to talk about Nargis without mentioning Raj Kapoor – a full third of Nargis’s filmography had her co-starring with him. She's been a part of his films since his directorial debut, Aag. Besides, Barsaat is important for another reason – it immortalised Nargis as an integral part of RK films – in its iconic logo. Barsaat begins with a flashy car on the winding hill roads. In it are two young men on a holiday. Though Pran (Raj Kapoor) would like to get to the city, Gopal (Premnath) wants to spend the night in the hills – he had met a young woman there the previous year. She is the sort of young woman who would charm Pran, he says, with all her talk of forever love and eternal waiting. Neela (Nimmi) is waiting for him as she had promised. Gopal is not beyond lying to her – about the reason for his arrival, about his love for her, about even looking at another girl. Neela smiles but tells him if she ever sees him with another woman, she would kill herself. As they lose themselves in each other, Neela begs Gopal to take her with him. He will, he promises, just as soon as the monsoons begin. For now, he has to leave in the morning. Not before he goes with her to a festival the next day, she demurs and Gopal agrees. Pran accompanies him to the venue where Neela is dancing. It interests Gopal only for a while, though, and soon the two men are on their way again, much to Neela’s distress. Pran realises the depth of Neela’s affections, but his pleas have no effect on Gopal. Not even when Gopal learns that Neela has given the money he’d left for her to Pran so the latter can buy her a sari. Gopal is not appeased; he feels she's being manipulative. In any case, they have to find a house to stay in. Both Pran and Gopal like a house jutting over the water, though Gopal’s interest in the house is due to the chowkidar’s nubile daughter, Reshma (Nargis). Unfortunately, an accident leaves Reshma at their house, and Pran spends the night looking after her while Gopal sleeps. The unconscious young woman has a strange effect on Pran, leaving him restless through the night. In the days following, he spends all his time with Reshma, while Gopal frequents a club in town. Pran is falling deeper and deeper in love with Reshma. However, while she sings his poems, it is clear that she doesn’t really understand love – not as he knows it. It is equally clear that she’s not unaffected by his presence nor his unconditional acceptance of her. The pure notes of Pran’s violin continue to draw Reshma to him. Despite her father having returned home, Reshma slips away to meet Pran in the night, half swooning into his arms. Pran’s belief that time waits for no one, that lovers have to always be ready to face hurdles, has a huge impact on the innocent Reshma. Faced with a stern father who upon her return, informs her that he has fixed her marriage with a man in the neighbouring village, and that her honour is the only wealth she has, Reshma falters. Her father is not cruel – he speaks from the experience of having seen men from the city arrive for their holidays and leave the hill women behind, weeping. Reshma is conflicted – on the one side is her father who distrusts every outsider for what he has seen them do; on the other is Pran, whose love is steadfast and who demands that same fidelity of her against all odds. And one dark, stormy night, Reshma’s love is put to test. When the notes of Pran’s violin call her to him, she discovers that her father has destroyed the oars of her little boat. Not knowing how to swim, Reshma uses a long rope to hold on to while she floats across. Only, her father cuts the rope, and Reshma is swept away by the current. The next morning finds the father wanting the men to leave the house. Gopal is furious at the perceived injustice, but Pran is devastated at the news of Reshma's demise. ‘In haathon mein kulhada uthaane se pahle mujhe ek baar pooch toh liya hota ki mera pyar kaisa hai?’ he asks Reshma’s father. ('Before you lifted that axe, couldn't you have asked me once whether my love was true?') Pran’s grief only deepens as days go on, and Gopal is touched by the strength of his love for Reshma. However, Reshma is not dead. She has been rescued by Bholu (KN Singh) who, upon discovering she’s alive, takes her to his house. Taking care of her following a vaid’s instructions, he comes to believe that she was sent specially for him. A month passes and Reshma regains consciousness only to learn that Bholu intends to marry her as soon as the monsoons arrive. Back in town, Pran is pining for his lost love. In the hills, Neela is pining for hers. A desolate Reshma is imprisoned by Bholu and has no way of getting to her babuji. And Gopal, impressed by the depth of Pran’s grief, is beginning to question his own beliefs. Barsaat told the story of two diametrically opposite men – city slickers both, their attitudes towards life and love couldn’t be more different. Gopal is a happy-go-lucky hedonist who only lives for the moment. His best friend, Pran is a poet who looks humorously upon his friend’s adventures and misadventures though his philosophy of life and love is more serious. Are they two men, or the externalisation of one man's internal conflict? At one point, driven almost mad by Pran’s grief, Gopal bursts out, ‘Mera bhi tumhari tarah tadapne ko jee chahta hain.’ ('I want to suffer as you do.') Pran concurs – perhaps they are one, after all. Because, 'Kabhi kabhi toh main bhi tumhe dekhkar yahi sochta hoon ki shaayad tum mera hii doosra roop ho.' ('Looking at you, I sometimes feel you are another part of me.) Two men, two ways of loving, or one man, warring with himself? Of course, Gopal can’t be serious for too long. Perhaps they should combine forces and love one girl – that would be the perfect love. Barsaat is the love story of these two men and their loves, underlined by a vein of melancholy. If Aag showed how love could be subdued, restrained, and sacrificial, then Barsaat burst forth with passion barely muted and the promise of ‘forever’. 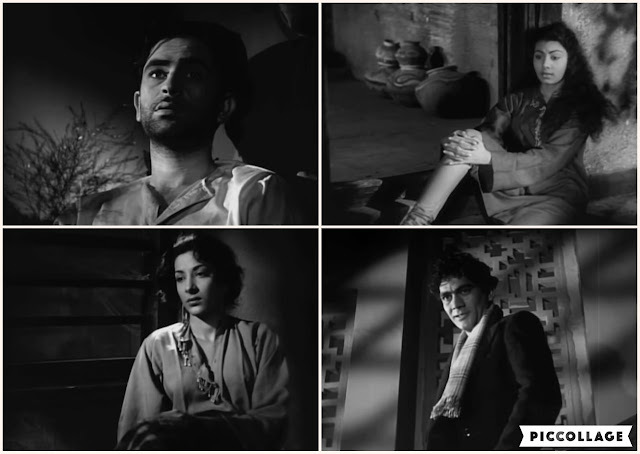 Reshma and Pran could hardly have evoked more passion than if they made love on screen – the physicality of the emotion between the leads would come to fruition in the Dum bhar ke udhar munh phero sequence in Awara, as well as in the raw emotional scene that follows. Here, two pairs of eyes gazing into each other, a maiden swooning as a man supports her with one arm, his violin loosely held in the other, depicted passion at its rawest. Nargis, barely 20 then (she celebrated her 20th birthday on the sets of the film), brought her rustic, innocent Reshma to life. Her real-life habit of wrinkling her nose and sniffing became a charming part of her on-screen character. Her narrative arc, from a young girl who’s blissfully in love to a woman who’s scarred by separation but who never loses her faith in her ‘pardesi’ to a quasi-'mem' whose love is the stronger for the trials she has undergone was a well-scripted one, and Nargis rose to the occasion. In one early scene, when she still doesn’t understand the depth of her feelings for Pran, she asks him, ‘Ye tumhara pyar bhi kaisa hai jisme shuru se aansu bhi shaamil hai?’ ('What sort of love is this that encompasses tears at the very beginning?') Her puzzlement, the depth of her feelings, her final understanding of his, all find expression in her mobile face and expressive eyes. Premnath, similarly, played the path of a thoughtless cad to perfection. When Nimmi’s character Neela is singing Barsaat mein humse mile tum sajan tumse mile hum, he’s already lost interest. It’s not just his face; his entire body language – the mindless tossing of peanuts into his mouth, the careless lounging, the disinterested departure before the performance ends – speaks volumes. The redemption of a cad through the love of a good woman is not an unknown trope; yet here, when redemption comes, it doesn’t happen overnight. If the madness of Pran’s grief shakes the foundation of Gopal’s cynicism, then the strength of Reshma’s faith teaches him what true love means. The character slowly grows in empathy and there is true repentance, an aching wish to be a better man and the urge to make reparation. The value of 'forever love' is a lesson that’s tragically learnt. Premnath also gets most of the humorous throwaway lines in the film, as befits his character. Unlike his characters in most of his other films, Raj Kapoor’s Pran is a straightforward, decent man. Someone who believes in true love and continues to love the woman he’s convinced he’s lost forever. Someone whose philosophy is to be kind to others, to cause others as little pain as possible. It is hard to watch this film and not believe in such love; to watch him and Nargis together and not believe they loved each other. His Pran is serious, sensitive and emotional. In one crucial scene, where Gopal forces him to go to a whore, Pran is initially contemptuous – she sells love? That contempt dissolves into pain when he sees her reality – respectfully, he touches her feet. The despoiling of innocence is a theme that Kapoor would return to, over and over again. The purity of love, the fires that sanctify it, the innocence that is besmirched by a cruel world would find its resonance in future films. Here, the personification of that theme is Neela – the hill maiden who spends her life waiting for a man who had never cared for her other than as a seasonal dalliance. Yet she, like Reshma, is true to her love. Unfortunately, she, unlike Reshma, doesn’t get a 'happily ever after'. Nimmi’s debut saw her don a persona which would become second skin – I doubt there’s one film where Nimmi gets a happy ending! Barsaat is the monsoon season, or even the rains, but there’s nary a drop on screen until the climax when the rain clouds hint at the darkness of grief. However, the mood is always there, evoked by song, by music, by words… Jal Mistry’s cinematography captures the misty hills and vales beautifully, framing scenes so that one gets the feeling of being in the hills during the rains. His innovative chiaroscuro created deft shadows and angled lighting, lending gloss to the narrative. 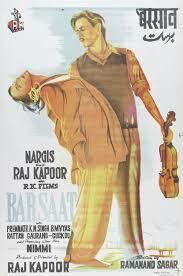 Barsaat saw the debut of Shailendra as lyricist and Shankar-Jaikishan as music directors. Their spectacular score played no small part in making the film a blockbuster. Barsaat’s success established Lata Mangeshkar as a voice to reckon with, allowed Raj Kapoor to build RK Studios, gave him his studio’s iconic logo and his 'dream team', and immortalised him and Nargis as a romantic pair. Barsaat is a slow-moving lyrical film. Watch it for the performances – all four leads, and KN Singh cast against type. It’s worth it. *The screen caps in this post are from a crisp, clean print lovingly remastered by Tom Daniels. You can watch the entire film on his channel here.